**Rates are based on a 1/2 acre lot or less for residential property. If larger than a 1/2 acre we will charge $10.00 per additional half hour after an hour of service. If your property is larger than a 1/2 acre, please give us a call and we can set up a time to come out to give you a free quote."" ***An initial scoop rate of $35.00 will apply if it has been 2 weeks or more since your yard has been cleaned. This will be the cost of your first visit. This fee will be due at the time of service. This rate is based on a 1/2 acre or less. $35.00 for the first hour & 1/2; $15 per additional 1/2 hour. This fee is due at the time of service. One-Time Cleaning or Initial Cleaning is due at the time of service. 1X a week service - you are billed every 4th visit a month. 2X a week service - you are billed every 8th visit a month. 1X every other week service - you are billed every 2nd visit a month. 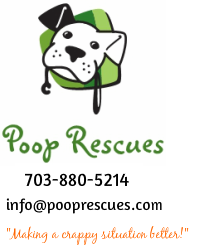 We will remove and haul away all waste from the dog run and santize the area with a veterinarian approved cleaning solution. If interested, please call us at 703-880-5214 for a free quote.